Modern is often described as a format where combo decks run wild and that identity is what makes many players love the format. The large, ever-growing, non-rotating card pool and the lack of universal safety valve cards like Legacy’s Force of Will provides fertile soil for the cultivation of powerful combos. That being said, there are answers for those combos and anyone who wants to play Modern needs to know both how the combos work and how to beat them. 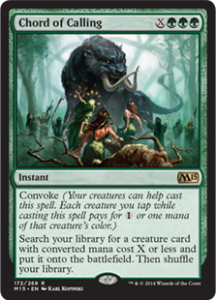 Today on the Combo Platter, we are going to look at the Green-White Counters Company deck. This deck looks to assemble the two card combo of Devoted Druid and Vizier of Remedies, which creates infinite mana that you can use to, for example, cast a Walking Ballista for a million damage. In addition to being known as a deck with an infinite, game-winning combo, Counters Company is also known as a toolbox deck. The hallmark of a toolbox deck is a suite of high-impact one-of cards in the main deck (with more options in the sideboard) and one or more ways to consistently search the deck for silver bullets in the matchups where they have the greatest impact. In Counters Company, the primary card that lets you search your toolbox is Chord of Calling. Chord’s Convoke ability allows this deck to use its most abundant card type (powerful, low-cost creatures) to find the missing combo piece or a card that dramatically changes a matchup. A card that fills a similar role to Chord of Calling in Counters Company is also one of the cards that gives this deck its name: Collected Company. Unlike Chord, Collected Company puts a limitation on they types of creatures it can find (3 or less converted mana cost) and it limits your selection to cards within the top six of your library. The benefit you get for this tradeoff is that you get two creatures, and that you spend fewer mana than you would on Chord of Calling. They synergy between Collected Company and the small creatures that feature in the deck’s primary combo is a key reason that this deck is viable in the Modern format. Each individual piece is efficient and powerful, but together, they are even more than the sum of the parts. 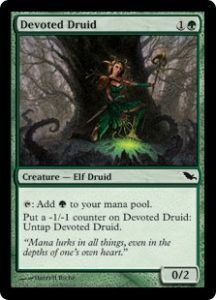 This means that with both of these creatures in play, we can untap the Devoted Druid by placing zero (the one we could place because of Devoted Druid, reduced by one because of Vizier) -1/-1 counters on it. It should not be a great leap at this point to see how we can use this setup to generate astounding amounts of Green mana! Tap for G, Untap by adding zero counters (reduced by Vizier), Tap for G, Untap…..∞! 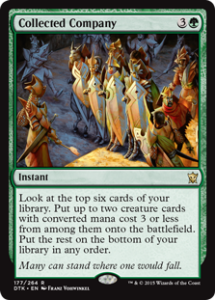 A boundless amount of Green mana is nice, but what are we going to do with it? 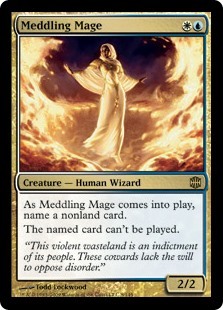 Some of the cards we looked at earlier (Chord of Calling, Collected Company) are great ways to use this mana — often repeatedly — to find a way to actually win the game or at least put it so far out of reach for the opponent that you have plenty of time to win in some other way. The Counters Company deck features several different options, all of which are creatures that can be found with the Green search spells. Duskwatch Recruiter — Activate the ability as many times as necessary to put every creature in your deck in your hand, three cards at at time. This lets you grab one of the other creatures that loves large amounts of mana and go to town. So, this combination of cards sounds extremely powerful and easy to assemble using the tools this deck has to offer! Why would anyone play anything else? How can Modern still be fun with a deck like this in the mix? 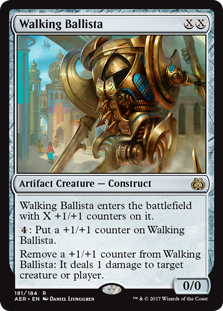 Well, like every deck in Modern, there is a way to disrupt the synergies and combos that it is looking to put together. Remove, preferably via to Exile rather than the graveyard, the key pieces of the combo or the payoff card(s). This is only effective if you can finish them off before they find another copy of the removed card. Blow up those lands or use Blood Moon to remove their ability to produce Green or White mana! Because they need to get to 4+ mana to use Chord of Calling and Collected Company for any kind of value, again you can slow them down. Effects like Pithing Needle/Phyrexian Revoker/Sorcerous Spyglass or Meddling Mage that keep the Counters Company deck from playing or using the cards essential to the combo or finishing off the opponent. 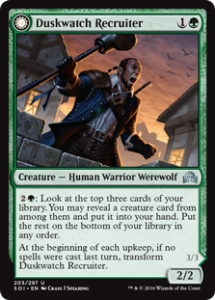 The Counters Company deck will definitely have utility creatures in their sideboard to fend off the cards you bring in to disrupt their combo, so don’t take your foot off the gas until you’ve done that last point of damage. They can come out of nowhere with the right creature searched up using Chord of Calling or Collected Company. Modern is a format where you want your deck to have matchups that feel like free wins. The power of your deck’s cards, synergies, and combos can put you in a position to take those free wins — sometimes as early as turn three with the right draw — but only if you know how to execute them. On the flip side, knowing how to beat those same properties of your opponent’s deck can give you the edge to win the games when they try to take those wins. Next time we will take a look at another Modern deck featuring a powerful combo. Until then, shoot your shot and dodge those silver bullets.